Serving all brothers of Zeta Beta and other chapters of Alpha Phi Omega. Members of the fraternity help create philanthropy projects with a goal to contribute and participate in throughout future semesters. Part of the pledging process requires Pledges to work on one project together for at least five hours. The Pledges find and carry out the project with the Brotherhood’s approval and help from the Pledge class President. Program Planning Conference (PPC) is a semi-annual event which takes place at the end of each semester. The purpose of PPC is for brothers to discuss and evaluate the projects from that semester in order to eliminate problems and plan for new projects. The brotherhood also discusses the goals of the executive officers and plans the calendar for the upcoming year. In the Spring of 2009 CPPC officially changed to CAPS as designated by the National Office. One way to encourage prospective members to rush Alpha Phi Omega is by setting up a specific Rush Project that they may attend to get a feel for what being in APO is all about. At the beginning of each semester, the Service and Membership VPs prepare an event that will be during Rush that prospectives may attend and use to build service hours before officially becoming Pledges. Favorite projects for this include Adopt-A-Highway and Merit Badge College. During the pledge period, Pledges have the opportunity to assist the Service Chairs with their projects and get a taste of leadership. Other opportunities as a Service Assistant include helping any of the Exec Board members, especially the President, Sergeant-At-Arms, Historian or the VP of Friendship. ZB brothers and alumni have helped over the years to spread their dedication of leadership, friendship, and service, to students at other colleges and universities by helping to reactivate chapters and spark interest in forming new ones. On February, 24, 1949, a ritual team went to Chapel Hill, North Carolina, to reactivate the Rho chapter. 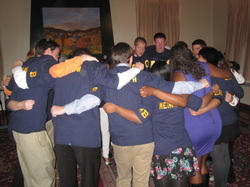 This was the first time Zeta Beta had been asked to send a ritual team to another university. On December 4, 1949, the chapter ritual team visited the University of Virginia with National Second Vice President Frank D. Wood, to reactivate the Theta chapter. In the fall of 1978, due to the efforts of John Thrasher, Steve Wilson and others, Zeta Beta helped to reactivate the Nu Rho Chapter at William and Mary. In 1979, Zeta Beta helped reactivate the Chi Gamma chapter at James Madison University and in 1980 helped reactivate the chapter at the University of Richmond. In the fall of 1982, led by Mary Jane Woebke, ZB began working with a group of Radford students who were interested in starting a chapter. In 1983, Zeta Beta donated $200 to the charter group, and in the spring of 1984, the Alpha Beta Zeta chapter at Radford College was chartered during a sectional conference hosted by Tech. During 1987, with the help of Dan Wheeler, Paul Louie, Dan Montague, and former ZB Advisor, Ms. Melinda Cox, Zeta Beta started to help a petitioning group at Roanoke College. In 1988, Zeta Beta donated $100 to their service program and hosted their initiation ceremony at Tech. During the Fall of 1993, John and Jamie (Perrine) Conover, ZB alumni studying at Virginia Commonwealth University, helped to found a petitioning group. After much hard work by the Conovers, the Alpha Delta Iota chapter was chartered by William and Mary in November 1994. Zeta Beta also helped with the chartering of Phi Omicron at Ferrum College. From 2000-2001, Brothers Holly Lynne McKinley and Jason Parker worked with the students at Ferrum to establish this chapter. The chapter first started in the late 1960’s with assistance from ZB, but never chartered due to the Vietnam War. Zeta Beta became the Big Brother Chapter once again, and the charter was established on December 7, 2001. For their work with Ferrum, Holly Lynne and Jason were awarded the Ellsworth S. Dobson Certificate of Merit. Until she moved to Richmond in 1981, Mrs. Margaret Blair, our founder's wife, provided ZB with friendship and countless memories of our history. In return, brothers throughout the year helped Mrs. Blair with annual fall and spring yard cleanups and other projects she had for us. Among others, Carolyn Falk, Matt Collins and Carroll Wontrop put in numerous hours of service for Mrs. Blair. As the fraternity grew in membership, Rose Lang and Tom Guinta chaired these projects and helped keep up the strong relationship between Mrs. Blair and the many brothers of Zeta Beta. Sadly, Mrs. Blair passed away November 1986. The Winter 1987 pledge class was named the Mrs. Margaret Buford Blair Memorial Pledge Class in her honor. Sober Rides (also called DD’s, or Designated Drivers) are a way to safely provide rides for Brothers and Pledges each Thursday, Friday and Saturday nights. In each car, there is a passenger to answer the phone and document each call and a driver. In the past, there was a DD phone, whose number was given to all brothers, and it was turned on between the hours of 10pm and 2am. Now, the driver and passenger brothers send an e-mail out of the day they are DDing with their phone numbers and the car they will be in. Each Active Brother must DD at least once each semester, and Pledges are not assigned this until their first semester as an Active Brother.